How does a sensor that has 360 degree vision and accurate depth information work? Simply put: a LIDAR sensor continually fires off beams of laser light, and then measures how long it takes for the light to return to the sensor. To understand why there’s so much support behind LIDAR today, it’s important to look at other similar technologies which have similar goals. The original depth-sensing robot was the humble Bat (50 million years old!). A bat (or dolphin, among others) is able to perform some of the same capabilities as LIDAR using echolocation, otherwise known as Sonar (sound navigation and ranging). 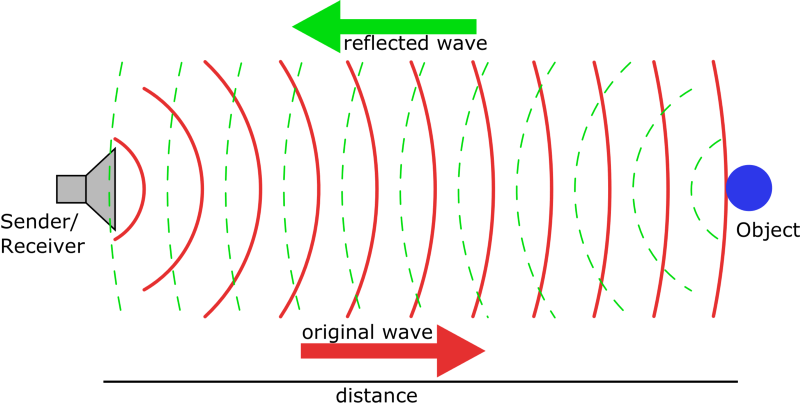 Instead of measuring light beams like LIDAR, Sonar measures distance using sound waves. After 50 million years of biological exclusivity, World War 1 advanced the timeline of the first major deployment of man-made Sonar sensors, with the advent of submarine warfare. Sonar works excellently in water, where sound travels far better than light or radio waves (more on that in a second). Sonar sensors are in active use on cars today, primarily in the form of parking sensors. These short-range (~5m) sensors enable a cheap way to know just how far that wall is behind your car. Sonar hasn’t been proven to work at the kinds of ranges a self-driving car demands (60m+). The world’s fourth-largest manufacturer of tires, Continental AG is a leading German automotive manufacturing company that specializes in brake systems, automotive safety, tachographs etc. Hi-res 3D flash LiDAR, SRL-CAM400 sensor module and SRL-1/SRL 1C are some of its leading products. A Canada-based company, LeddarTech provides advanced detection and ranging systems that are based on patented technology. Founded in 2007, its unique Lidar technology performs time-of-flight measurement using pulses from infrared light processed through innovative algorithms, accurately detecting a wide range of objects under various environmental conditions. Quanergy Systems Inc. develops smart sensing solutions for real-time 3D mapping, object detection, tracking and classification. Its 3D time-of-flight LiDAR sensors are designed to meet mass commercial deployment criteria in various markets. Some of its popular products are the S3 solid-state LiDAR sensor and M8-1LiDAR sensor. Velodyne LiDAR provides a full line of sensors, which are capable of delivering the most accurate 3D data in the market. Their products have application in various industries like geology, agriculture, automotive, robotics, R&D, urban planning etc. One of the largest suppliers of automotive components, the various verticals that Bosch serves are consumer goods, industrial technology, mobility solutions and energy & building solutions. As per its latest announcement, Bosch will sell LiDAR by 2020 to meet the market demand for high-tech sensors. One of world’s pre-eminent precision steering solutions companies, Novariant provides intelligent sensor & control systems, precision positioning technologies, advanced steering hardware and applications software which combine to deliver integrated machine control solutions. These solutions are of immense use in the agriculture, automotive, and construction industries, as well as other control technology in emerging market segments that require a high level of accuracy, consistency, and availability. Established in 1949, DENSO is a leading supplier of advanced automotive technology, systems and components for major automakers. Industrial products, consumer products and OEM automotive systems & components are some of its key products. DENSO has also developed in-vehicle LiDAR for automotive applications. Hella is one of the largest trade organizations for automotive parts, accessories, diagnostics and services within Europe. It develops products for specialist vehicles along with entirely independent applications like street lighting, systems, and electronic components for the automotive industry. Hella’s numerous ADAS are based on camera, ultrasonic, infrared LiDAR, and 24 GHz radar technology. A Canada-based company, Phantom Intelligence develops LiDAR technology sensors aimed at obstacle detection and anti-collision applications to increase the safety of vehicles. Among the world’s leading providers in the area of sensor technology, First Sensor develops and produces customer-specific solutions for the ever-increasing number of applications in the industrial, medical, and mobility target markets. Based on innovative technology platforms, the company develops products such as chips, components, sensors, and entire sensor systems. Teledyne Optech, a Canada-based compan, is one of the leaders in the development and manufacturing of advanced LiDAR and camera survey instruments for airborne, mobile and terrestrial mapping systems. Its Optech Lynx MG Mobile Mapper generates rich mapping-grade LiDAR and image data from a vehicle at cruising speeds. A multinational automotive supplier, Valeo focuses on the design, manufacture and sale of components integrated systems and modules for the automotive industry. Its LiDAR sensor offers an aperture angle of 140°, which makes it quite useful for automated driving schemes like a ‘parking lot assistant’ that autonomously drives the vehicle to a parking lot. Technavio’s market research analyst predicts the global automotive light detection and ranging (LiDAR) sensors market to grow at a high CAGR of more than 34% by 2020. LiDAR sensors are widely used to automate driving of vehicles through obstacle detection and avoidance, which would enable safe navigation. With almost all the original equipment manufacturers (OEMs) and Tier-I players working towards automated driving, LiDAR technology occupies a very prominent position in achieving level 3 and level 4 in vehicle automation. Car manufacturers such as Delphi, Continental, Bosch, Audi, Mercedes-Benz, and Google are working to expand the autonomous driving concept and advanced driver assistance systems (ADAS) systems in vehicles. With the increasing shift towards self-driving or unmanned vehicles, the application of automotive LiDAR sensors will witness a huge surge in the coming years. Owing to the evolution from infotainment concept to telematics features in vehicles, functionalities such as ADAS and vehicle-to-vehicle (V2X) are gaining wide significance. The growing technological advancements in driverless cars have necessitated the use of efficient safety features besides infotainment, security, and performance efficiency. With regulations mandating several safety aspects, consumer demands are also pressurizing the OEMs to offer new technology-enabled features such as radar sensors and blind spot monitoring. Favorable government regulations that promote road safety will enhance the deployment of ADAS in autonomous vehicles. Additionally, the emerging V2X connectivity will play a vital role in achieving autonomous driving, and spur the adoption of ADAS and subsequently LiDAR sensors in vehicles. The automotive LiDAR sensors market for autonomous driving will register a high CAGR of more than 230% by 2020. LiDAR has gained wide acceptance in autonomous driving applications as an inherent component in automated vehicles, which is driven by a reduction in price points. Major OEMs and Tier-I players are coming up with autonomous car technologies which will boost the sales of LiDAR sensors. Also, the rapid shift towards Levels 3, 4, and futuristic 5 vehicle automation will positively impact the growth of the automotive LiDAR sensors market which is expected to deploy self-driving capabilities in the vehicles. Arrow Drone – #3DPrinted #RacingDrone to race at 150 Km/h, equipped with GPS and #GoPro Camera…Cool!